Morton Lake was an ill-fated venture of the Commercial Club to create a summer resort northeast of the city. The East Fork of the Whitewater was dammed at North 17th Street, creating a recreational lake approximately a mile long. 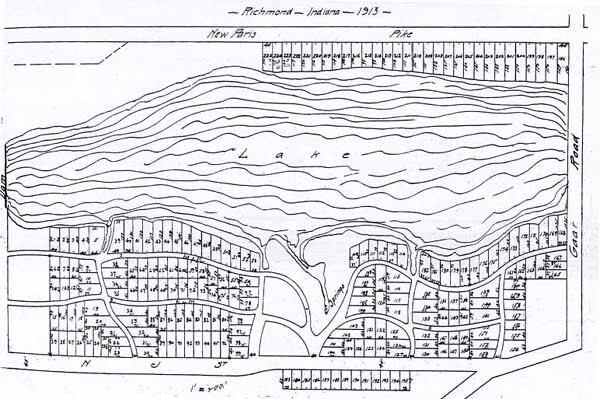 The subdivision north of North J Street and comprised of Maple and Elm Drives and Walnut Avenue, as well as the houses on New Paris Pike (State Road 121) west of North 24th Street, were all laid out as part of this development. The grand opening of the park took place on June 11, 1914 with approximately 8,000 people in attendance. The program included a Mr. J. O. Gill, a daredevil balloonist who rode his balloon to great heights and then parachuted down. He claimed to have performed this feat many times over the previous ten years without a serious injury, but on this day his parachute did not open, and he plunged head first to the ground. His death in front of so many spectators ruined the festive atmosphere of the opening. The Palladium's headline for the following day didn't help: "Park is Dedicated in Human Blood," it screamed. 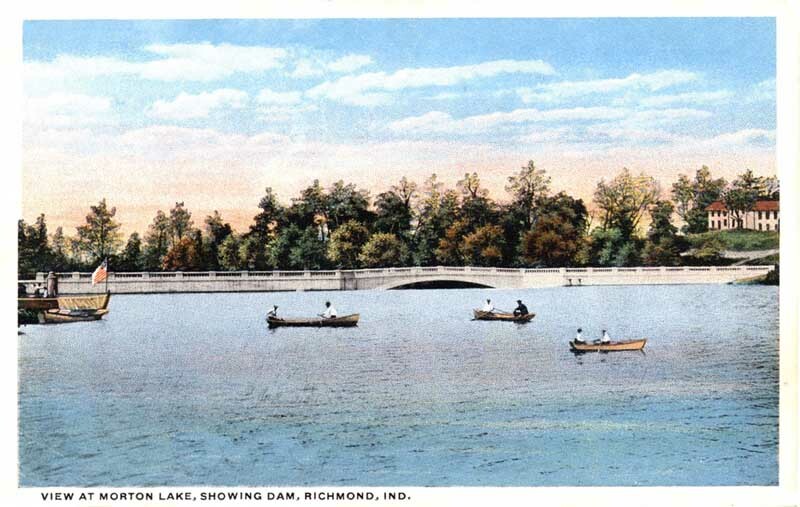 In addition to the small rowboats seen in this postcard, the Lake boasted its own steamboat. Built and captained by a man named Henry Rogers, the "Wild Rover" ferried passengers the length of the lake and, by all accounts, was very popular. At the end of the first season the management bought the Rover, then must not have prepared it adequately for the winter, because by April 1915 the boat was half sunk. "Some of the unsunken parts were taken during the winter to supply warmth to skaters. Parts of the engine and other equipment were stolen. Her steering apparatus has been tampered with..." The management vowed to have the boat operational in a few weeks. At some point, however, the Rover was either scuttled or broke loose from its moorings and sank near the dam. The remains were uncovered in 1952, when the dam was blasted open to alleviate flooding in the area. The park did seem to enjoy success for a few years. It had a swimming area, bath house, dancing pavilion (which burned in 1917), and various carnival-like games. But by 1919, the endeavor had been abandoned. The lake had not been dredged and the east end had filled with sediment until an island had formed. In 1920 the land was sold at public auction and the Morton Company disbanded. The bridge at North 17th Street still exists, although it is not accessible by car. 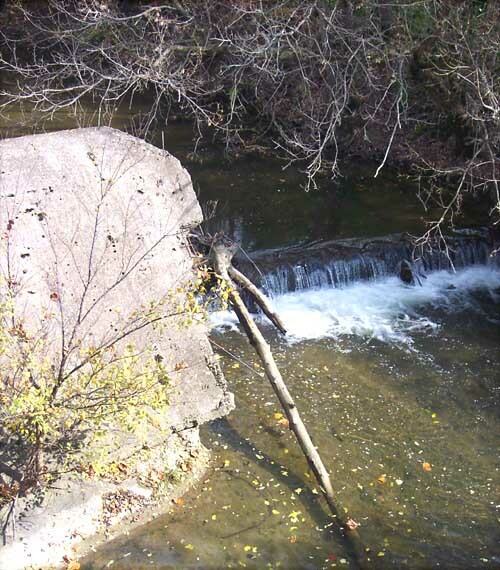 Much of the concrete dam is still recognizable, but it was blasted in 1952, and now the river flows through the center of it.